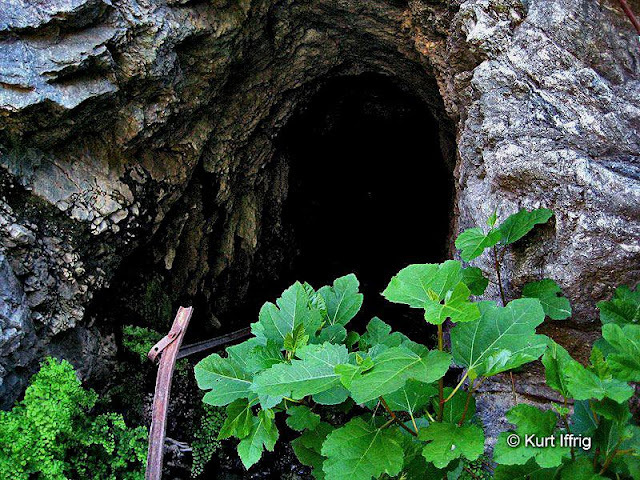 Note the bent ore cart rail at the portal and the Mission Fig Tree, common to these canyons. 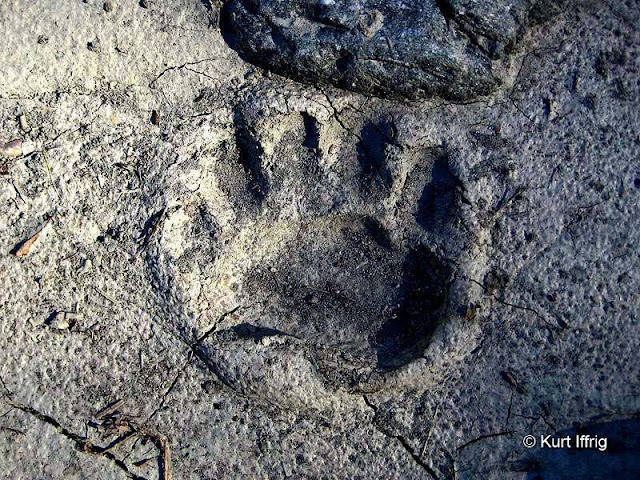 The silt bed near the mine is a living museum of every animal that's passed through, including this black bear. The Horseshoe Mine, named after a horseshoe shaped bend in the East Fork is a largely unknown and unrecorded gold mine located downstream from the Bridge to Nowhere. John Robinson, the well known mine historian mentions nothing about it in any of his books. Even the forest service is apparently unaware of it. However, thanks to the fine detective work of the late, great adventurer Hugh Blanchard I was able to put together a brief history of this mine. When mines are abandoned the ore rails are usually removed and sold for scrap, but these ones still remain. 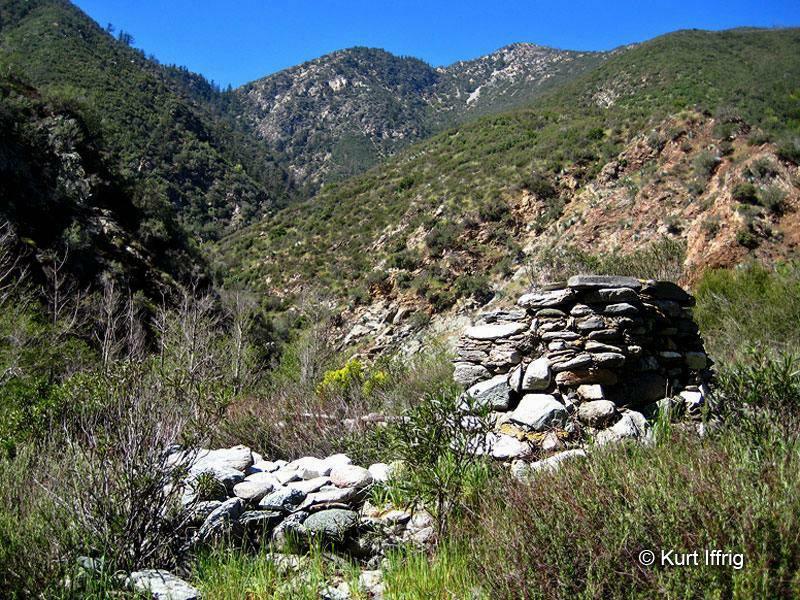 Private Property For Sale By "Bridge To Nowhere"
"A few generations back, my grandfather and his partners claimed the Horseshoe Mine and Horseshoe Mine Annex on the East Fork of the San Gabriel River outside Los Angeles. In the 1930's, the County built a road up as far as the Narrows [which are just north of the property] and started a tunnel. Unfortunately for the road, one of our four or five hundred-year floods came along and wiped out the road in large part. Years later, the County formally abandoned the road. Now for the interesting part. We are left with 50 acres surrounding the Bridge to Nowhere, called by some authors one of the prettiest areas on the East Fork. I am most interested in either using the property or disposing of it by sale or trade. It is presently rented both for recreational gold mining and to Bungee America, who conducts jumps from the Bridge. This beautiful parcel needs to stay in private hands. There is another parcel, which may be even more interesting. 32 acres really isolated up on the Shoulder of Sheep Mountain, 2-3 miles from the Bridge. This is one of the last of the Bighorn Sheep Breeding areas. Access guaranteed by the Wilderness Act, but roads are a scarcity up there. The interesting part is that it guarantees access to the Wilderness Area, regardless of future USFS policies." 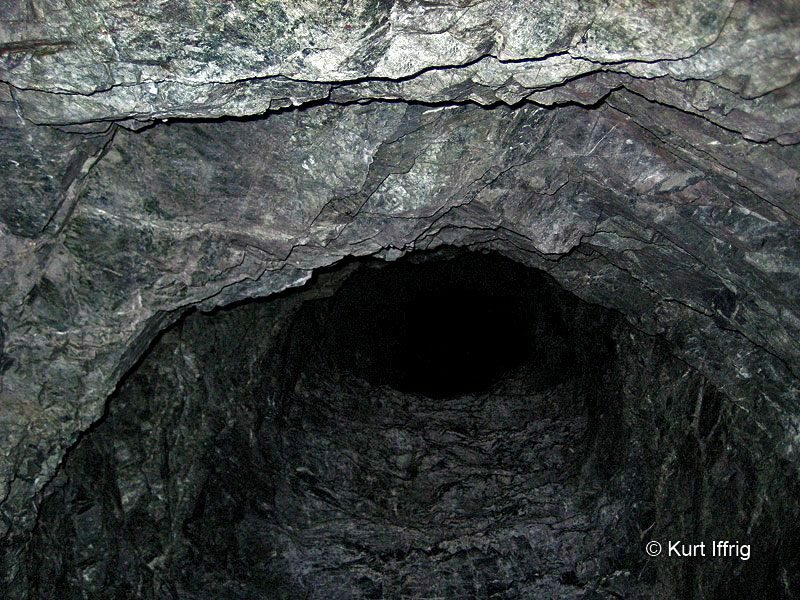 At the end of the main tunnel the miners ran out of solid rock, but kept mining in three directions. The Bridge to Nowhere is currently leased by the late Frank Saunder's family to Bungee America Inc. Although this bridge is located in the middle of nowhere, you'll find a long line of people on any given weekend waiting to take a thrilling plunge. The bridge is technically located on private land, but there's a posted sign that allows access for the public to pass, so long as a list of rules are adhered to. Most people abide by them, some do not, but there's virtually no way to enforce these rules in such a remote area. This is what I refer to as the "right crawl". Everything beyond this point is unsupported and very dangerous. 176 feet of this unstable breccia lies beyond the "right crawl". Note the drill bit stuck in the rock, upper right. Horseshoe Mine is built into a cliff wall, once hidden by trees, next to the East Fork river and downstream from the Bridge to Nowhere. Relatively few people know about this mine, even though you'll pass directly over the top of it on your way to the bridge. The reason is that most hikers do not take the river route all the way to the bridge, opting instead for a well worn trail on the right side of the canyon. This mine also has a significant annex tunnel somewhere in the same general area that I have yet to find. Above the river bank on the opposite side of the mine there is a noticeable stone cabin ruin. You can see what it looks like by scrolling down. 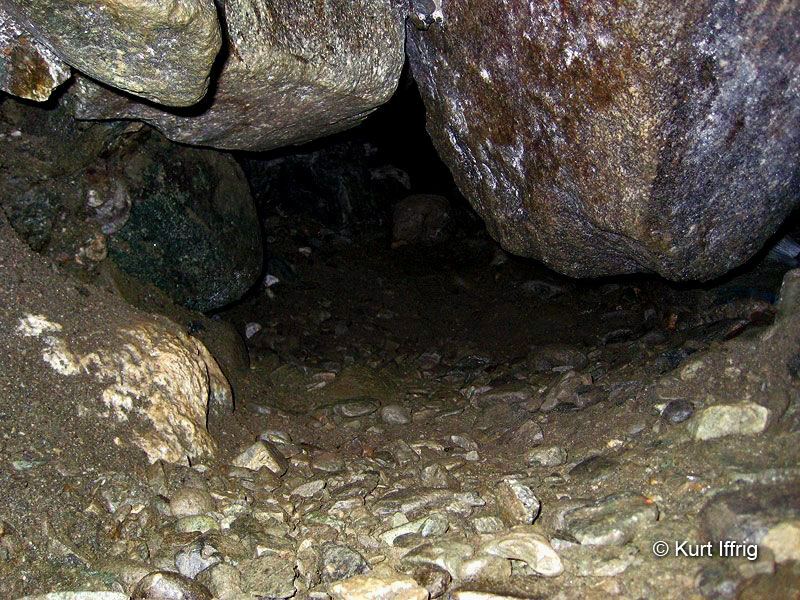 The short "left crawl" leads into a large, hollowed out round room with a broken shovel left behind. The main adit is about 225 feet deep and about 5 to 6 feet high. At about the 147 foot mark there is a hole bored upwards into the ceiling which I strongly believe leads to a second level, however without a tall ladder I will never know for sure. At the end of the main tunnel the miners ran into a snag. The hard rock they were tunneling through suddenly became alluvial breccia (which is basically gravel cemented by gravity). Nevertheless they decided to continue on, by digging upwards and to the left and right sides through dangerous low crawls. Looking out from the back of the main adit. 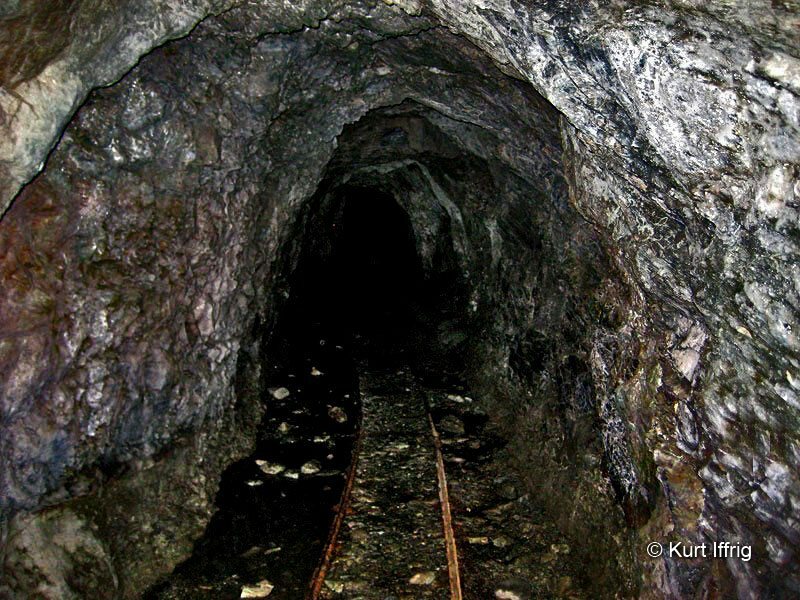 I regard the first 225 feet of this mine as relatively safe. 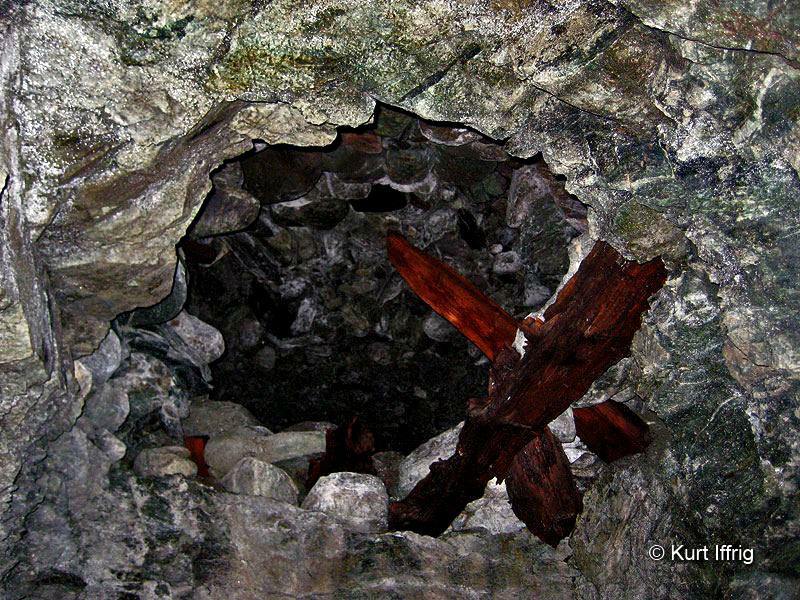 The upper diggings lead to a small room with wooden boards embedded in the crumbling floor. The left crawl leads to a hollowed out round room that's about 12-15 feet deep. 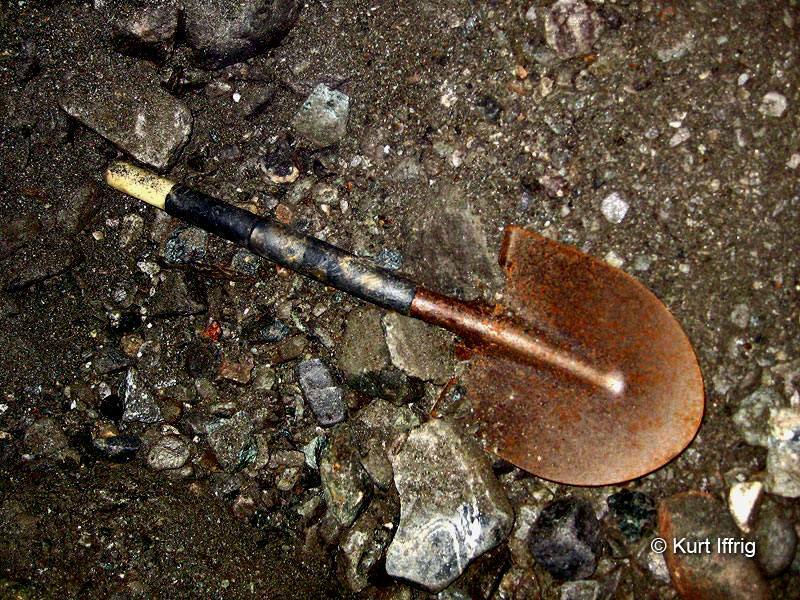 A broken shovel has been left behind in this area. The right crawl is horrific, and a strongly urge against going inside. It's basically a "deadman's drift", meaning a totally unsupported wormhole which is ready to collapse at any moment. 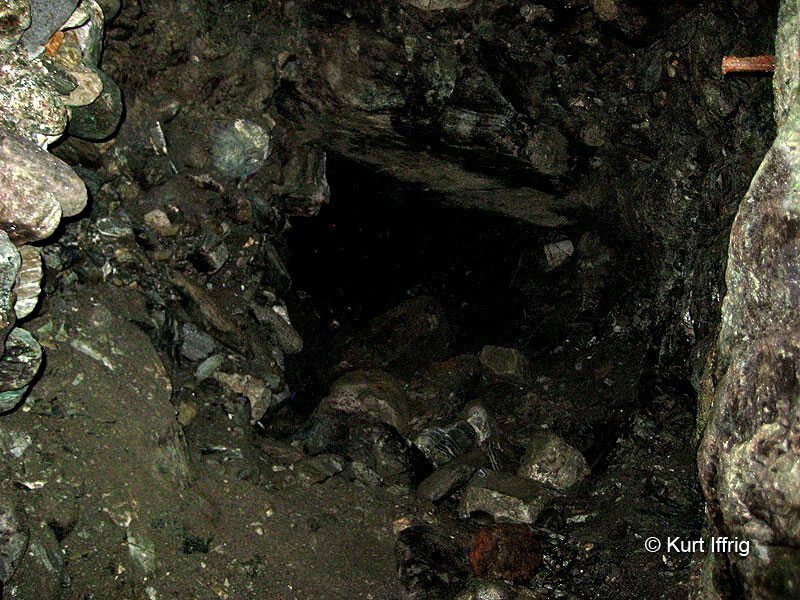 Nevertheless, there is at least one amateur miner storing equipment in this area, and apparently pulling rocks out one by one. This tunnel goes in for an additional 176 feet. Slightly downstream on the opposite side of the river, stone cabin ruins can be found in the brush. One final note on this mine; there is some modern equipment being stored inside by at least one amateur miner. Apparently he or they are hauling rocks one by one out of the right crawl. Whether this is legal or illegal is not for me to say, but there was one item among the others that I found a bit disturbing. Next to a gas container and a sluice machine I found what appeared to be a large homemade pipe bomb. If that was indeed the case, my guess is that bombs like these are being used as makeshift dynamite inside the right crawl to widen the already collapsing tunnel. Whether I'm right or wrong, I will never again enter that particular tunnel. Upstream from the Horseshoe Mine you'll find the famous Bridge To Nowhere, a bungee jumping hot spot. 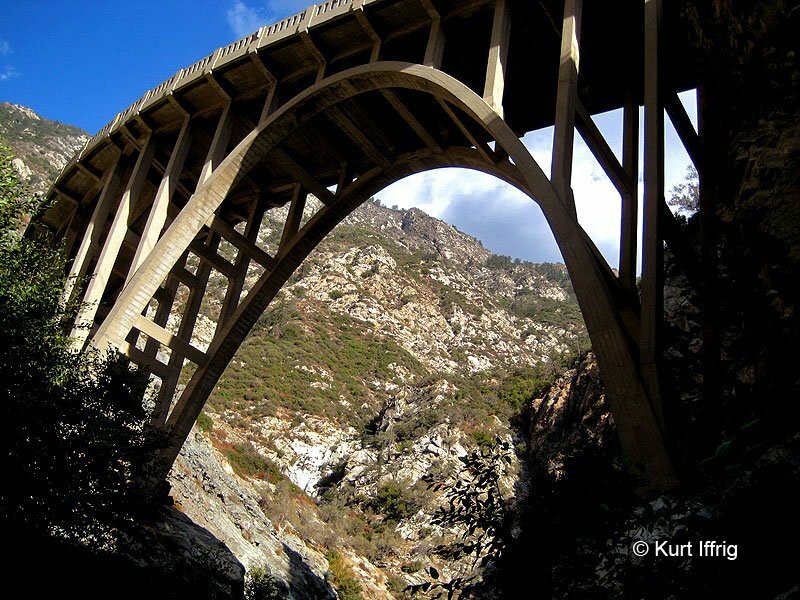 The Bridge to Nowhere was built back in 1936 and spans the deepest gorge in the San Gabriel Mountains. It was originally part of a road that was meant to connect the San Gabriel Valley with Wrightwood. The bridge was completed, but the road leading to it was washed out during the Great Flood of March 1 & 2, 1938. As a result, the project was abandoned, leaving the bridge forever isolated in the middle of the Sheep Mountain Wilderness. The far side of the bridge originally led into a partially built tunnel, which was later destroyed. Today this bridge a popular destination for hikers and bungee jumpers. 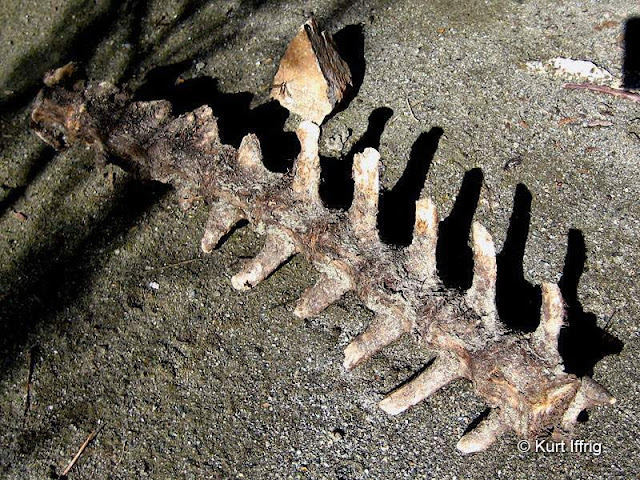 I find a lot of old animal skeletons in the streambed. This backbone is probably from a deer or a big horn. Flash floods have been a constant curse to this canyon. Aside from wiping out the early mining towns of Prospect Bar and Eldoradoville in the 1800's, dozens of hikers have been killed over the years by swift water while making river crossings on the way to the bridge. Today sections of the old asphalt roadway can still be found along the East Fork Trail. Along the way you will also cross over the John Seals Bridge, a short wooden bridge marking the beginning of the Sheep Wilderness. Big Horn Sheep can commonly be seen in the rocky areas along this popular trail. Interestingly, the Bridge to Nowhere has an even bigger brother that spans Big Tujunga Narrows on the Angeles Forest Highway, between the Angeles Crest and Palmdale. 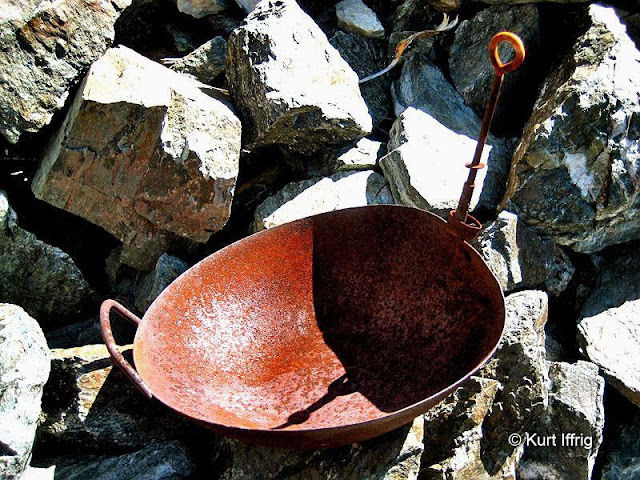 If you would like to learn more about the long lost mining communities of Prospect Bar, Eldoradoville and the depression era shantytown of Klondike, please see my post on Heaton Mine, one of many other mines along the East Fork. 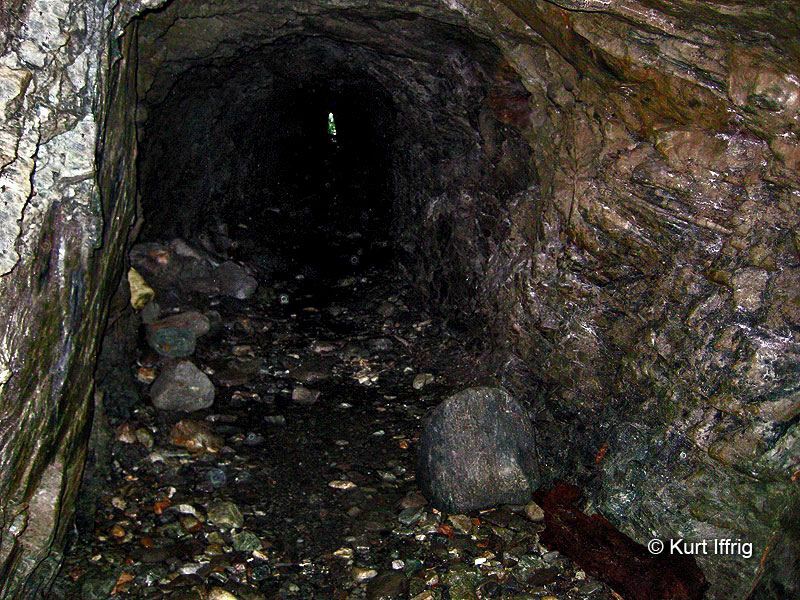 I will also be adding photos of the Horseshoe Mine Annex tunnel if it is located. Here's an old mining artifact I found downstream from the bridge. I have no idea was it was used for. 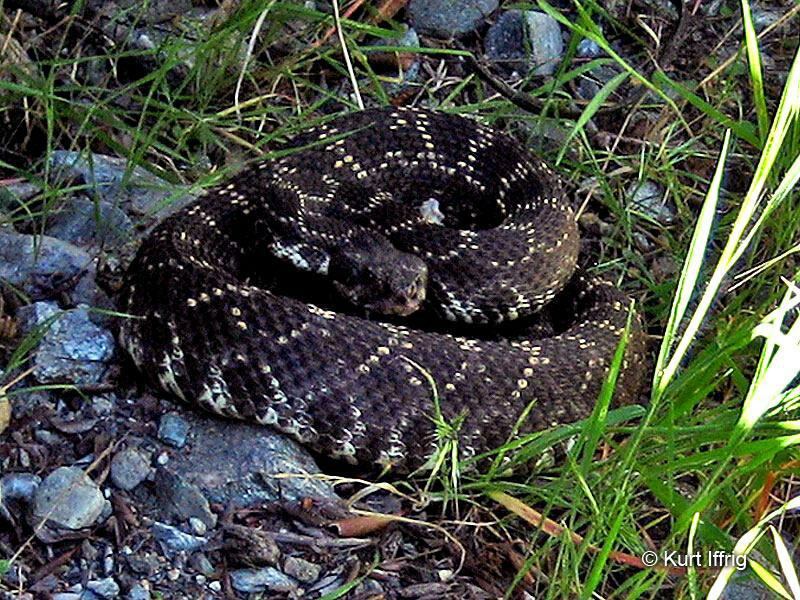 In the photo below you'll see a Southern Pacific rattlesnake I encountered while hiking through the brush near the mine. I see these on almost every trip I take, and they've never given me much of a problem. The only exception was a time that I accidentally stepped on one while hiking in the dark and got bit on the boot, but fortunately it did not pierce the leather. Rattlesnakes are not the monsters people make them out to be. You have to really try hard to actually get bit, and their bite is almost never fatal, although it is extremely painful. I'm always on the lookout for these when I travel cross country and in the back of my mind I think about the long hike out and the cost of anti-venom should I get hit. This rattler was about five feet in length. The striking range of these snakes is about half their body length.